Available Cats - Young Cats Ready for Retirement ... Are Now Ready for your Home! Contact us today for more information about future retirees! and fill out our Adoption Application to be considered for ownership. New Potential Owner to be able to let them go. Above are Barolo and Malbec and both boys are living happily together with their new family... thank you Beth and Tom for giving our boys such a wonderful home! This is one of our Fire x Romeo Kittens all grown up... he has been place in a new home. Mr Wonderful, as we call him, has gone home with Roy and is living very happily, now named "Houdini," with another one of our Kittens! Our handsome Studman has been selected and is happily living in Boulder, CO with his new owner! 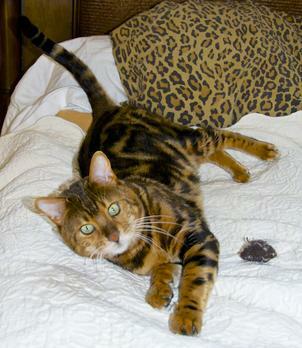 At Santa Fe Bengal Cattery, we want all of our Cats to have a happy life. After just a few years of "service" in our breeding program, our Studs and Queens are available to become household pets. They are altered prior to adoption and are at an "at cost" price to mainly cover the Vet fees. Young, RETIRED CATS typically range from $350. to $600., depending on their quality of markings. Show quality Cats may have a higher price. Please see the "Available Kittens" page for Kitten pricing. Click HERE to see new photographs of soon to be retired cats, who will be available for purchase in the coming months. We feel that our Cats deserve to live with all of the advantages of a household pet for the majority of their lives. Bengals usually live from 18 or 20 years old! Sometimes a three or four year old Cat is a better option for some new owners. Click HERE to find out more about our Cattery philosophy. It matters to us that our cats have the best and are the best. 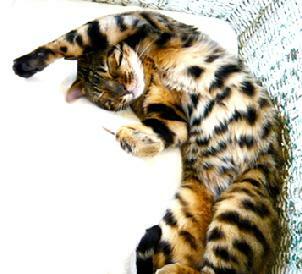 Santa Fe Bengal Cattery works very hard to have healthy Kittens and Cats, and we guarantee our Kittens' health! Please see the "Purchase Contract" page for the details. The news at the Cattery is all about the new Cat House and Habitat for the Boys. We feel that our Stud Cats need more living space... they already have many times the "recommended" space, however, we want them to have larger living and play spaces... and new trees to climb, Kitty exercise wheels, and more sunshine filled nap perches to keep them happy. It will take quite a few Kitten sales to pay for the new expansion, but as always we want to do the best we can for our Cats. Most of our reward is the love we receive back from our Beautiful Bengal Cats, also knowing that we are responsibly improving the Bengal breed, and we especially enjoy the many thanks that we receive from our Kitten and Cat new owners! We arrived home safely and our new girls are happily exploring their new home. Well , we have discovered that Portia likes to be tucked into a blanket. Last night she went up to Darren and waited for him to arrange his blanket, he fixed it up for her and Portia jumped up into it and he covered her up and she stayed there ALL night with her little head and leg popping out once in a while. Right now, Portia is relaxing with Darren all snuggled up in a blanket. She has had a wonderful morning. Gregory came home from work around 10am and Portia flirted and rolled and played with Gregory on our bed like she was a kitten. Followed Gregory around until he had to go back to work. She seems soooo happy! She played and ate and walked around with a happy tail. Portia really likes all of us, but our son, Gregory, seems to get that extra attention. She is so very sweet! Gregory has never seemed so happy!